Raymond Frederick Harryhausen (June 29, 1920 – May 7, 2013) was an American-born British artist, designer, visual effects creator, writer and producer who created a form of stop-motion model animation known as "Dynamation". His most memorable works include: working with his mentor Willis H. O'Brien on the animation for Mighty Joe Young (1949), which won the Academy Award for Best Visual Effects; his first color film, The 7th Voyage of Sinbad (1958); and Jason and the Argonauts (1963), which featured a famous sword fight with seven skeleton warriors. His last film was Clash of the Titans (1981), after which he retired. Harryhausen moved to the United Kingdom, became a dual US-UK citizen and lived in London from 1960 until his death in 2013. During his life, his innovative style of special effects in films inspired numerous filmmakers. In November 2016 the BFI compiled a list of those present-day filmmakers who claim to have been inspired by Harryhausen, including Steven Spielberg, Peter Jackson, Joe Dante, Tim Burton, Nick Park, James Cameron, and Guillermo del Toro. Others influenced by him include George Lucas, John Lasseter, John Landis, Henry Selick, J.J. Abrams, and Wes Anderson. Harryhausen was born in Los Angeles, California, the son of Martha L. (née Reske) and Frederick W. Harryhausen. Of German descent, the family surname was originally spelled "Herrenhausen". After having seen King Kong (1933) on its initial release for the first of many times, Harryhausen spent his early years experimenting in the production of animated shorts, inspired by the burgeoning science fiction literary genre of the period. 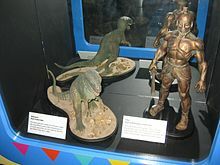 The scenes utilising stop-motion animation (or model animation), those featuring creatures on the island or Kong, were the work of pioneer model animator Willis O'Brien. His work in King Kong inspired Harryhausen, and a friend arranged a meeting with O'Brien for him. O'Brien critiqued Harryhausen's early models and urged him to take classes in graphic arts and sculpture to hone his skills. Meanwhile, Harryhausen became friends with an aspiring writer, Ray Bradbury, with similar enthusiasms. Bradbury and Harryhausen joined the Los Angeles-area Science Fiction League formed by Forrest J. Ackerman in 1939, and the three became lifelong friends. Harryhausen secured his first commercial model-animation job, on George Pal's Puppetoons shorts, based on viewing his first formal demo reel of fighting dinosaurs from a project called Evolution of the World, which was never finished. During World War II, Harryhausen served in the United States Army Special Services Division under Colonel Frank Capra, as a loader, clapper boy, gofer and later camera assistant, whilst working at home animating short films about the use and development of military equipment. During this time he also worked with composer Dimitri Tiomkin and Ted Geisel ("Dr. Seuss"). Following the war, he salvaged several rolls of discarded 16 mm surplus film from which he made a series of fairy tale-based shorts, which he called his "teething-rings". One of Harryhausen's most long-cherished dreams was to make H.G. Wells' The War of the Worlds. After World War II, he shot a scene of an alien emerging from a Martian cylinder, showing the fearsome being from Mars fatally succumbing to an earthly illness, contracted from the air the natives breathe harmlessly. It was part of an unrealized project to adapt the story using Wells' original "octopus" concept for the Martians. In 1947 Harryhausen was hired as an assistant animator on what turned out to be his first major film, Mighty Joe Young (1949). O'Brien ended up concentrating on solving the various technical problems of the film, leaving most of the animation to Harryhausen and Pete Peterson. Their work won O'Brien the Academy Award for Best Special Effects that year. The first film with Ray Harryhausen in full charge of technical effects was The Beast from 20,000 Fathoms (1953) which began development under the working title Monster From the Sea. The filmmakers learned that a long-time friend of Harryhausen, writer Ray Bradbury, had sold a short story called "The Beast from 20,000 Fathoms" (later retitled "The Fog Horn") to The Saturday Evening Post, about a dinosaur drawn to a lone lighthouse by its foghorn. Because the story for Harryhausen's film featured a similar scene, the film studio bought the rights to Bradbury's story to avoid any potential legal problems. Also, the title was changed back to The Beast from 20,000 Fathoms. Under that title, it became Harryhausen's first solo feature film effort, and a major international box-office hit for Warner Brothers. It was on The Beast From 20,000 Fathoms that Harryhausen first used a technique he created called "Dynamation" that split the background and foreground of pre-shot live action footage into two separate images into which he would animate a model or models so seemingly integrating the live-action with the models. The background would be used as a miniature rear-screen with his models animated in front of it, re-photographed with an animation-capable camera to combine those two elements together, the foreground element matted out to leave a black space. Then the film was rewound, and everything except the foreground element matted out so that the foreground element would now photograph in the previously blacked out area. This created the effect that the animated model was "sandwiched" in between the two live action elements, right into the final live action scene. In most of Harryhausen's films, model animated characters interact with, and are a part of, the live action world, with the idea that they will cease to call attention to themselves as only "animation." Most of the effects shots in his earliest films were created via Harryhausen's careful frame-by-frame control of the lighting of both the set and the projector. This dramatically reduced much of degradation common in the use of back-projection or the creation of dupe negatives via the use of an optical printer. Harryhausen's use of diffused glass to soften the sharpness of light on the animated elements allowed the matching of the soft background plates far more successfully than Willis O'Brien had achieved in his early films, allowing Harryhausen to match live and miniature elements seamlessly in most of his shots. By developing and executing most of this miniature work himself, Harryhausen saved money, while maintaining full technical control. A few years later, when Harryhausen began working with color film to make The 7th Voyage of Sinbad, he experimented extensively with color film stocks to overcome the color-balance-shift problems. Ray's producer/partner Charles H. Schneer coined the word Dynamation as a "merchandising term" (modifying it to "SuperDynaMation" and then "Dynarama" for some subsequent films). Harryhausen was always heavily involved in the pre-production conceptualizing of each film's story, script development, art-direction, design, storyboards, and general tone of his films, as much as any auteur director would have on any other film, which any "director" of Harryhausen's films had to understand and agree to work under. Only the complexities of the Directors Guild of America's rules in Hollywood prevented Harryhausen from being credited as the director of his films, resulting in the more modest credits he had in most of his films. Throughout most of his career, Harryhausen's work was a sort of family affair. His father did the machining of the metal armatures (based on his son's designs) that were the skeletons for the models and allowed them to keep their position, while his mother assisted with some miniature costumes. After Harryhausen's father died in 1973, Harryhausen contracted his armature work out to another machinist. An occasional assistant, George Lofgren, a taxidermist, assisted Harryhausen with the creation of furred creatures. Another associate, Willis Cook, built some of Harryhausen's miniature sets. Other than that, Harryhausen worked generally alone to produce almost all of the animation for his films. Harryhausen soon met and began a fruitful partnership with producer Charles H. Schneer, who was working with the Sam Katzman B-picture unit of Columbia Pictures. Their first tandem project was It Came from Beneath the Sea (a.k.a. Monster from Beneath the Sea, 1955), about a giant octopus attacking San Francisco. It was a box-office success, quickly followed by Earth vs. the Flying Saucers (1956), set in Washington D.C. – one of the best of the alien invasion films of the 1950s, and also a box office hit. In 1954, Irwin Allen had started work on a second feature-length documentary film, this one about animal life on land called The Animal World (completed in 1956). Needing an opening sequence about dinosaurs, Allen hired premier model animator Willis O'Brien to animate the dinosaurs, but then gave him an impossibly short production schedule. O'Brien again hired Harryhausen to help with animation to complete the eight-minute sequence. It was Harryhausen's and O'Brien's first and only professional full-color work. Most viewers agree that the dinosaur sequence of Animal World was the best part of the entire movie (Animal World is available on the DVD release of O'Brien's 1957 film The Black Scorpion). Harryhausen then returned to Columbia and Charles Schneer to make 20 Million Miles to Earth (1957), about an American spaceship returning from Venus. The spaceship crashes into the sea near Sicily, releasing an on-board alien egg specimen which washes up on shore. The egg soon hatches a creature that, in Earth's atmosphere, rapidly grows to gigantic size and terrifies the citizens of Rome. Harryhausen refined and improved his already-considerable ability at establishing emotional characterizations in the face of his Venusian Ymir model, creating yet another international box office hit. Schneer was eager to graduate to full-color films. Reluctant at first, Harryhausen managed to develop the systems necessary to maintain proper color balances for his DynaMation process, resulting in his biggest hit of the 1950s, The 7th Voyage of Sinbad (1958). The top-grossing film of that summer, and one of the top-grossing films of that year, Schneer and Harryhausen signed another deal with Columbia for four more color films. After The Three Worlds of Gulliver (1960) and Mysterious Island (1961), both great artistic and technical successes, and successful at the box office, according to Harryhausen, who stated in the DVD and Blu Ray featurette about the making of Mysterious Island: "Mysterious Island was one of the most successful films that we made and I am glad people are still enjoying it today". And Gulliver " Made its' profits"[verify] as Ray is quoted in Jeff Rovin's bio-book From The Land Beyond Beyond: The Making of the Movie Monsters You've Known and Loved - The Films of Willis O'Brien and Ray Harryhausen. His next film is considered by film historians[who?] and fans as Harryhausen's masterwork, Jason and the Argonauts (1963). Among the film's several celebrated animation sequences is an extended fight between three actors and seven living skeletons, a considerable advance on the single-skeleton fight scene in Sinbad. This stop-motion sequence took over four months to complete. Harryhausen next made First Men in the Moon (1964), his only film made in the 2.35:1 widescreen (a.k.a. "CinemaScope") format, based on the novel by H. G. Wells. Jason, and First Men in the Moon were box office disappointments at the time of their original theatrical release. That, plus changes of management at Columbia Pictures, resulted in his contract with Columbia Picture not being renewed. Also, as the 1960s counter-culture came to influence more and more and younger filmmakers, and failing studios struggled to find material that was popular with the new "Boomer-generation" audience, Harryhausen's love of the past, setting his stories in ancient fantasy worlds or previous centuries, kept him from keeping pace with changing tastes in the 1960s. Only a handful of Harryhausen's features have been set in then-present time, and none in the future. As this revolution in the traditional Hollywood movie studio system, and the influx of a new generation of film makers sorted itself out, Harryhausen became a free agent. Harryhausen was then hired by Hammer Film Productions to animate the dinosaurs for One Million Years B.C. (1966). It was a success at the box office, helped in part by the presence of Raquel Welch in her second film. Harryhausen next went on to make another dinosaur film, The Valley of Gwangi with Schneer. The project had been developed for Columbia, who declined. Schneer then made a deal with Warner Brothers instead. It was a personal project to Harryhausen, which he had wanted to do for many years, as it was storyboarded by his original mentor, Willis O'Brien for a 1939 film, Gwangi, that was never completed. Set in Mexico, The Valley of Gwangi is a parallel Kong story—cowboys capture a living Allosaurus and bring him to the nearest Mexican city for exhibition. Sabotage releases the creature, and it wreaks havoc on the town. The film features a roping scene reminiscent of 1949's Mighty Joe Young (which was itself recycled from the old Gwangi storyboards), and a spectacular fire and animation sequence inside a cathedral toward the end of the film. Schneer and Harryhausen finally were allowed by MGM to produce a big budget film with name actors and an expanded effects budget. The film started out smaller but then MGM increased the budget to hire stars such as Laurence Olivier. It became the last feature film to showcase his effects work, Clash of the Titans (1981), for which he was nominated for a Saturn Award for Best Special Effects. For this film, he hired protégé model animators Steve Archer and two-time Oscar-nominated Jim Danforth to assist with major animation sequences. Harryhausen fans will readily discern that the armed-and-finned kraken (a name borrowed from medieval Scandinavian folklore) he invented for Clash of the Titans has similar facial qualities to the Venusian Ymir he created twenty-five years earlier for 20 Million Miles to Earth. Perhaps because of his hermetic production style and the fact that he produced half of his films outside of Hollywood (living in London since 1960), reducing his day-to-day kinship with other more traditional, but still influential Hollywood effects artists, none of Harryhausen's films were nominated for a special effects Oscar. Harryhausen himself says the reason was that he worked in Europe, but this oversight by the AMPAS visual-effects committee also occurred throughout the 1950s when Harryhausen lived in Los Angeles. In spite of the very successful box office returns of Clash of the Titans, more sophisticated computer-assisted technology developed by ILM and others began to eclipse Harryhausen's production techniques, and so MGM and other studios passed on funding his planned sequel, Force of the Trojans, causing Harryhausen and Schneer to retire from active filmmaking. In the early 1970s, Harryhausen had also concentrated his efforts on authoring a book, Film Fantasy Scrapbook (produced in three editions as his last three films were released) and supervising the restoration and release of (eventually all) his films to video, laserdisc, DVD, and currently Blu-ray disc. A second book followed, Ray Harryhausen: An Animated Life, written with author and friend Tony Dalton, which details his techniques and history. This was then followed in 2005 by The Art of Ray Harryhausen, featuring sketches and drawings for his many projects, some of them unrealized. In 2008 Harryhausen and Dalton published a history of stop-motion model animation, A Century of Model Animation, and, to celebrate Harryhausen's 90th birthday, The Ray & Diana Harryhausen Foundation published Ray Harryhausen – A Life in Pictures. In 2011 the last volume, called Ray Harryhausen's Fantasy Scrapbook, was also published. Harryhausen continued his lifelong friendship with Ray Bradbury until Bradbury's death in 2012. Another long-time close friend was Famous Monsters of Filmland magazine editor, book writer, and sci-fi collector Forrest J Ackerman, who loaned Harryhausen his photos of King Kong in 1933, right after Harryhausen had seen the film for the first time. Harryhausen also maintained his friendships with his long-time producer, Charles H. Schneer, who lived next door to him in a suburb of London until Schneer moved full-time to the USA (a few years later, in early 2009, Schneer died at 88 in Boca Raton, Florida); and with model animation protégé, Jim Danforth, still living in the Los Angeles area. Harryhausen and Terry Moore appeared in small comedic cameo roles in the 1998 remake of Mighty Joe Young, and he has also provided the voice of a polar bear cub in the Will Ferrell film Elf. He also appears as a bar patron in Beverly Hills Cop III, and as a doctor in the John Landis film Spies Like Us. In 2010, Harryhausen had a brief cameo in Burke & Hare, a British film also directed by Landis. In 1986 Harryhausen formed The Ray & Diana Harryhausen Foundation, a registered charity in the UK and US, which preserves all of his collection and promotes the art of stop-motion animation and Harryhausen's contribution to the genre. In 2002, young animators Seamus Walsh and Mark Caballero helped Harryhausen complete The Story of the Tortoise and the Hare. This was the sixth and final installment of the Harryhausen fairy tales. The film was started in 1952 and completed in 2002, 50 years later. Caballero and Walsh refurbished the original puppets and, under Harryhausen's direction and guidance, completed the film. The film went on to win the 2003 Annie award for best short film and gained worldwide attention. Walsh and Caballero have since moved on to form their own stop motion company, Screen Novelties, which is based in Los Angeles, California. TidalWave Productions' Ray Harryhausen Signature Series produced authorised comic book adaptions of some of Harryhausen's unrealised projects from 2007 on. In 2009, he released self-colorized versions on DVD of three of his classic black and white Columbia films: 20 Million Miles to Earth, Earth vs. the Flying Saucers, and It Came from Beneath the Sea. He also personally supervised the colorization of three films, two of them in partial tribute to their producer Merian C. Cooper who had supervised King Kong, that inspired him as a young man: The Most Dangerous Game (1932), She (1935), and the non-Cooper film Things to Come (1936). Ray Harryhausen was given a special tribute, for his ninetieth birthday, at the BFI Southbank theater in London, where he had lived since the 1960s, which was attended by all the top visual effects directors and technicians and was hosted by director John Landis. At this event he was presented by Peter Jackson with a special BAFTA award from the British Academy of Film and Television Arts. Harryhausen married Diana Livingstone Bruce in October, 1962. The couple had a daughter, Vanessa. The family announced Harryhausen's death via Twitter and Facebook on May 7, 2013. Diana survived her husband by five months. The Daily Mirror quoted Harryhausen's website, saying his "influence on today's film makers was enormous, with luminaries; Steven Spielberg, James Cameron, Peter Jackson, George Lucas, John Landis and the UK's own Nick Park have cited Harryhausen as being the man whose work inspired their own creations." Harryhausen himself drew a distinction between films that combine special effects animation with live action, and films that are completely animated, such as the films of Nick Park, Henry Selick, Ivo Caprino, Ladislav Starevich and many others (including his own fairy tale shorts) which he sees as pure "puppet films", and which are more accurately (and traditionally) called "puppet animation". Harryhausen left his collection, which includes all of his film related artefacts to the Ray & Diana Harryhausen Foundation, which he set up in 1986 to look after his extensive collection, to protect his name and to further the art of model stop-motion animation. The trustees are his daughter Vanessa Harryhausen, Simon Mackintosh, actress Caroline Munro who appeared in The Golden Voyage of Sinbad  and film maker John Walsh, , who first met with Ray Harryhausen in 1988 as a film student of the London Film School and made a documentary entitled Ray Harryhausen: Movement Into Life, narrated by Doctor Who actor Tom Baker. [better source needed] The Foundation's website charts progress on the restoration of the collection and future plans for Harryhausen's legacy. In 2013, the RH foundation and Arrow Films released a feature-length biography of Harryhausen and his films called Ray Harryhausen - Special Effects Titan on Blu-Ray. Featuring photos, artifacts, and film clips culled directly Harryhausen's estate and never before seen by the public, the film was initially released only in the UK, but was finally released on Blu-Ray in America in 2016. Some of Ray Harryhausen's most iconic models and artworks were showcased as part of the Barbican Centre's 'Into the Unknown' exhibition from June 3 to September 1, 2017. The exhibition programme showcased an all-encompassing exploration of science fiction, from its roots in classic literature, through to modern day cinema blockbusters, allowing visitors to view Ray's creative output within the wider context of the genre. To mark Ray's 97th birthday on July 29, 2017, the Barbican posted a guest blog by the Foundation's Collections Manager Connor Heaney, highlighting the animator's lasting influence on science fiction. An exhibition at Tate Britain from the 26th June to the 19th November 2017 features work from the Harryhausen collection and short film made by John Walsh on the restoration of a painting owned by Harryhausen which influenced his work. In a podcast interview with BritFlicks, Walsh discusses his plans to develop lost Ray Harryhausen film projects. In July 2018, it was announced that the largest ever exhibition of Ray Harryhausen's models and artwork would take place at the Scottish National Gallery of Modern Art in Edinburgh, to mark his centenary in the summer of 2020. In February 2016, a podcast was devised by John Walsh and is co-hosted by him and Collections Manager Connor Heaney. During the 1980s and early 1990s, those of Harryhausen's growing legion of fans who had graduated into the professional film industry started lobbying The Academy of Motion Picture Arts and Sciences to acknowledge Harryhausen's contribution to the film industry, and so, in 1992 the Academy finally awarded him The Gordon E. Sawyer Award (effectively a lifetime achievement "Oscar") for "technological contributions [which] have brought credit to the industry", with actor Tom Hanks as the Master of Ceremonies, and Ray Bradbury (a friend from when they were both just out of high school) presenting the award to him. After the presentation to Harryhausen, actor Tom Hanks told the audience, "Some people say Casablanca or Citizen Kane...I say Jason and the Argonauts is the greatest film ever made!" A long series of appearances at film festivals, colleges, and film seminars around the world soon followed as Harryhausen met many of the millions of people who had grown up enjoying his work. The Science Fiction Hall of Fame inducted Harryhausen in 2005, the first year it honored non-literary contributors. [a] He received the annual British Fantasy Society Wagner Award in 2008 for his lifetime contribution to the genre. Ray received an honorary BAFTA in June 2010 at a ceremony at the British Film Institute. His mask award was presented to him by filmmaker Peter Jackson. The Academy Film Archive has preserved a number of Ray Harryhausen's films, including Guadalcanal, How to Bridge a Gorge, and The Story of Hansel and Gretel. Fan and film maker tributes to Harryhausen abound in many forms. The Mythos Games/Virgin Interactive Entertainment computer game Magic and Mayhem (1999) features over 25 stop-motion mythological creatures that were inspired by Harryhausen's work. Constructed by special effects expert and stop-motion animator Alan Friswell, the various characters include a dragon, a centaur, a griffin and a fighting skeleton. For the griffin's wing animation, Friswell studied the griffin from The Golden Voyage of Sinbad (1974). Friswell subsequently worked for the Ray and Diana Harryhausen Foundation, restoring many of the original animation models used in Harryhausen's films. Friswell still holds the position of official restorer for the Foundation. The 1992 comedy-horror film Army of Darkness features the titular army resembling the army of skeletons from Jason and the Argonauts. Tim Burton considers his satiric science fiction movie, Mars Attacks! (1996), to be a tribute to Harryhausen, especially in a scene in which one of the hostile alien's flying saucers chops down the Washington Monument by crashing into it, just as Harryhausen had done in his movie Earth vs. the Flying Saucers in 1956. The Gravity Falls episode, "Little Gift Shop of Horrors" (specifically the "Clay Day" segment), has several references to Ray Harryhausen and his work. In the 2005 film Corpse Bride, while Victor is at Victoria's house, he plays the piano, which is labelled as a "Harryhausen". The 2007 song Worried About Ray, by London pop rock band The Hoosiers, is inspired by and is about Harryhausen. A short clay-animation film, "Martian Peen Worm" (abridged from a much longer title) made in the 1970s in Texas by Ivan Stang of Church of the SubGenius fame, refers to the worm at one stage of its growth-development as a "Nesuahyrrah", Harryhausen spelled backwards. Another 17-minute short film made in 2005, "Southwestern Orange County Vs. The Flying Saucers" uses identical saucer models to Harryhausen's similarly-titled 1956 alien invasion movie. In March 1983, Harryhausen participated in a special one-day event at Mann's Chinese Theater celebrating the 50th anniversary of premier screening of the 1933 King Kong in the same theater. Visual effects technicians from several film-effects facilities recreated the life-sized bust of Kong as it appeared in the theater's outer lobby area 50 years earlier. The August 1983 issue of American Cinematographer features three articles about the event. The Valley of the Mist (1950): An unrealized Willis O'Brien project about the discovery of an Allosaurus in a lost valley. The concept later became the basis for Harryhausen's 1969 film The Valley of Gwangi. The Elementals (1952): Harryhausen wrote the original outline story about bat creatures that nest in the Eiffel Tower and terrorize Paris, France; he sold the idea for development to Jack Dietz in 1953, but the project, after several scripts—including one by Ray Bradbury—languished. A test sequence was nonetheless filmed showing Harryhausen battling one of the bat creatures on a hill. The Tortoise and the Hare (1953): Only partially filmed, the shelved project was resumed a half-century later and completed in 2002 by Harryhausen, in collaboration with animators Seamus Walsh and Mark Caballero (who had offered Harryhausen, long-retired since 1981, their services to help him finish the film). ^ After inducting 36 fantasy and science fiction writers and editors from 1996 to 2004, the hall of fame dropped "fantasy" and made non-literary contributors eligible. Alongside one writer, the first three were Harryhausen, illustrator Chesley Bonestell, and film-maker Steven Spielberg. ^ "The Ray and Diana Harryhausen Foundation". Facebook. Retrieved 2013-05-10. ^ Lyons, Patrick J. (2013-05-07). "Ray Harryhausen, Whose Creatures Battled Jason and Sinbad, Dies at 92". New York Times. Retrieved 2016-08-27. ^ "Mighty Ray Harryhausen". bfi.org.uk. ^ "Hollywood effects wizard Ray Harryhausen dies at 92". USA TODAY. Retrieved 2019-03-01. ^ "Special F/X Pioneer Ray Harryhausen Dies At 92". variety.com. ^ "Interview with Henry Selick". Film AVClub. Retrieved 2019-03-06. ^ "Dynamation! The 7th Voyage of Sinbad + Jason and the Argonauts: A Tribute to Ray Harryhausen (1920-2013)". The Cinematheque. Retrieved 2019-03-06. ^ "Wes Anderson says Isle of Dogs is inspired by Akira Kurosawa". Little White Lies. Retrieved 2019-03-08. ^ Mandell, Paul (December 1992). "Of Genies and Dragons: The Career of Ray Harryhausen". American Cinematographer. via Questia.com. 73 (12). Retrieved 2013-05-10. ^ The Harryhausen Chronicles, documentary written and directed by Richard Schickel, 1997. ^ Love, Damien (November 2007). "Monsters, Inc. An Interview with Ray Harryhausen". Bright Lights Film Journal. Retrieved 2009-08-22. ^ "Dynamation". Ray Harryhausen: the official website. Rayharryhausen.com. 2009. Archived from the original on 2012-02-23. Retrieved 2012-02-24. ^ "Model Heroes: ... Ray Harryhausen recalls the battles behind the scenes of Jason and the Argonauts". Ray Harryhausen. The Guardian. December 20, 2003. Retrieved 2009-01-27. This is an edited extract from Ray Harryhausen: An Animated Life by Ray Harryhausen and Tony Dalton (Aurum Press, 2003). ^ Amazon page Retrieved 2009-01-27. ^ "Charles H. Schneer, Sci-Fi Film Producer, Dies at 88" by Margalit Fox, The New York Times, January 27, 2009, p. A28 (NY edition). Retrieved 2009-01-27. ^ "BLUEWATER: Ray Harryhausen and Bluewater Make A Splash". Comiclist. 2007-01-24. Retrieved 2017-09-17. ^ Facebook. Ray and Diana Harryhausen Foundation Facebook Page Retrieved 2013-06-07. ^ "Diana Harryhausen Dies". file770.com. 14 October 2013. Retrieved 20 September 2017. ^ Rankin, Ben (May 7, 2013). Ray Harryhausen dead: Movie veteran dies Mirror.co.uk. Retrieved 2013-06-07. ^ a b BBC. Ray Harryhausen, visual effects master, dies aged 92 Retrieved 2013-06-07. ^ a b c Comingsoon.net. RIP Ray Harryhausen: 1920–2013 Retrieved 2013-05-08. ^ a b "The Ray & Diana Harryhausen Foundation". rayharryhausen.com. London, UK. Retrieved 7 August 2018. ^ "Into the Unknown - Barbican". www.barbican.org.uk. Retrieved 20 September 2017. ^ "5 Ways Ray Harryhausen Influenced Science Fiction - Barbican Blog". blog.barbican.org.uk. Retrieved 20 September 2017. ^ "Ray Harryhausen – Mythical Menagerie - Science Museum Oklahoma". sciencemuseumok.org. Retrieved 20 September 2017. ^ "The best museum exhibits in the U.S. this fall". usatoday.com. Retrieved 20 September 2017. ^ "Here are the winners of the (Gasp!) 16th Annual Rondo Hatton Classic Horror Awards – The Rondo Hatton Classic Horror Awards". rondoaward.com. ^ Tate. "The Art of Ray Harryhausen: Until 19 November 2017 – Display at Tate Britain - Tate". Tate. Archived from the original on 16 September 2017. Retrieved 20 September 2017. ^ "Review: The Art of Ray Harryhausen". scifibulletin.com. 13 July 2017. Retrieved 20 September 2017. ^ "John Walsh Talks About His Political Documentary TORYBOY & Plans To Develop Lost Harryhausen Scripts". britflicks.com. ^ "Hollywood comes to Valence House - London Borough of Barking and Dagenham Council". lbbd.gov.uk. ^ "Dagenham special effects exhibition to showcase models from Jason and the Argonauts". yellowad.co.uk. ^ "Podcasts - The Ray and Diana Harryhausen Foundation". www.harryhausen100.com. ^ "Ray Harryhausen Revisited" Ray Bradbury's forward to The Animated Life (2003), via Amazon. Retrieved 2009-01-27. ^ "Harryhausen – 25 Years Ago 1992, Oscars Award | Stop Motion Works News". www.stopmotionworks.com. Retrieved 2019-02-17. ^ Sony Names Theater After Ray Harryhausen. The Wrap. Retrieved 2012-10-22. ^ a b ""It's Official! Inductees Named for 2005 Hall of Fame Class"". Archived from the original on March 26, 2005. Retrieved August 30, 2016. . Press release March 24, 2005. Science Fiction Museum (sfhomeworld.org). Archived 2005-03-26. Retrieved 2013-03-22. ^ "Science Fiction and Fantasy Hall of Fame" Archived May 21, 2013, at the Wayback Machine. Mid American Science Fiction and Fantasy Conventions, Inc. Retrieved 2013-04-09. This was the official website of the hall of fame to 2004. ^ "Harryhausen, Harry" Archived May 14, 2013, at the Wayback Machine. The Locus Index to SF Awards: Index of Dramatic Nominees. Locus Publications. Retrieved 2013-04-09. ^ "Ray Harryhausen" "Hollywood Walk of Fame"
^ "Ray Harryhausen 90th Birthday Celebration Photos". www.bafta.org. ^ "Fun Factory". The Daily Telegraph. December 31, 2001. ^ YouTube. youtube.com. Retrieved 27 May 2015. Monster Bash Magazine December 2007 no. 7, "20 Million Miles to Harryhausen" by Lawrence Fultz Jr.
Van Helsing's Journal April, 2011 no. 12, "A Conversation with Harryhausen" by Lawrence Fultz Jr.
Ray Harryhausen - Master of the Majicks, an exhaustive limited edition three-volume set of books by Mike Hankin showcasing Harryhausen and his films (release of Volume 3 is currently pending). "Ray Harryhausen biography". Science Fiction and Fantasy Hall of Fame. This page was last edited on 9 April 2019, at 22:49 (UTC).